The slow cooker isn’t your only tool in the campaign for healthy time-saving meals. Check out what your freezer can do. By using the time you might have available on a weekend you can create some fabulous meals which will last weeks, if not months, in your freezer. Prior to getting started you will need some supplies to make these recipes foolproof. Zipping freezer bags, tight-sealing plastic containers and aluminum baking pans with lids will keep your food from freezer burn until you are ready to enjoy them. Unstuffed Pepper Soup - 1 pound lean ground meat (93% beef or turkey), 3 large green bell peppers - chopped, 1 large onion - chopped, 2 cans fat free beef broth, 2 cans tomato soup, 1 can diced petite tomatoes, 2 cans chopped mushrooms, 1 1/2 C cooked brown rice. In large pan brown meat, green peppers, onion and drain. Stir beef broth, tomato soup, tomatoes and mushrooms. Bring to boil, reduce heat cover and simmer for 30 min, stirring occasionally. Cook rice, add to soup and heat through. Transfer to a tight-sealing plastic container and freeze until night before serving. 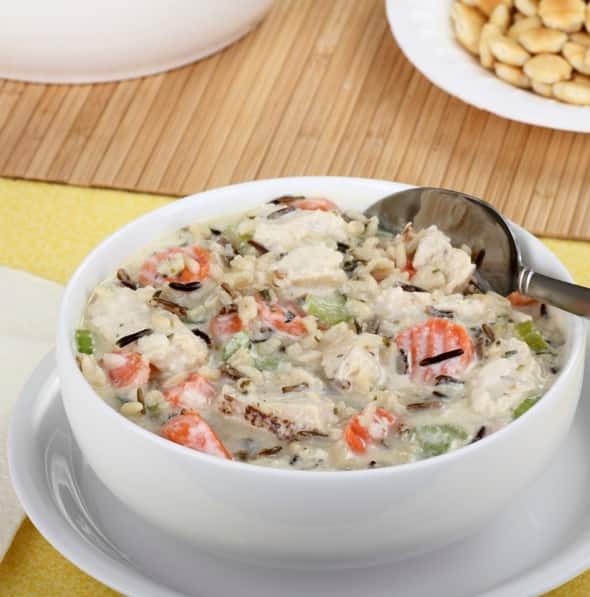 Creamy Chicken & Rice Soup - 1 T olive oil, 1 large onion chopped, 1 large carrot chopped, couple of celery ribs chopped, 8 C fat free chicken broth, 2 C cooked brown rice, 1 C cooked wild rice, 1/4 t salt, 1/4 t pepper, 1 can fat free evaporated milk, 2 large chicken breasts - chopped. Cook rice per package instructions. In a saucepan or soup pot, saute onion, celery and carrots in a bit of olive oil. Cook until vegetables are tender. Puree 1/4 of mixture to add thickness without using flour (add a bit of the broth to ease the process, if desired). Mix puree and vegetables in a large stockpot and slowly add broth. Stir in chicken breast. Cook until chicken is done - 10 minutes or so. Add rice, salt and pepper. Cook over medium heat until bubbling and thickened. Stir in evaporated milk. Cook for another 5 minutes. Transfer to a tight-sealing plastic container and freeze until night before serving. 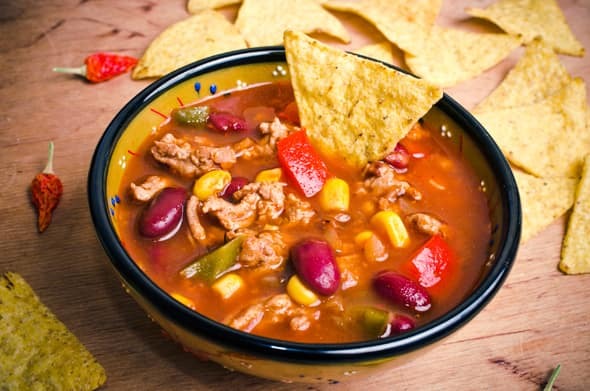 Taco Soup - 1 lb. lean ground meat, 1 large onion - chopped, 1 pkg. taco seasoning mix, 1 pkg. fat free ranch dressing mix, 1 can of each of the following with their juice: pinto beans, whole corn, diced tomatoes, tomato sauce (8 oz. can), black beans, kidney beans, 1 can water. Brown ground meat and onion. Drain. Mix ranch and taco seasoning mix into meat. Add other ingredients. Bring to a boil, cover and simmer 1 hour. Transfer to a tight-sealing plastic container and freeze until night before serving. Ground meat - if you are planning any meals with ground meat consider browning and seasoning prior to the day you plan to use. This can easily be frozen in a zipping freezer bag. Baking and freezing casseroles in an aluminum baking pan on the weekend are a great way to save time during the week. Just make sure to remember to remove them from the freezer the night before and place them in the refrigerator - lesson learned the hard way. By using disposable aluminum baking pans you can eliminate some dishes you have to do after dinner. Most dollar stores have them for $1-$2. Frozen veggies are a quick and healthy side dish. Most grocery stores will hold $10/10 deals on their store brand bags of frozen vegetables a couple times a year. Use these sales to stock up on your favorite veggies. Use pre-prepared ingredients as much as possible such as canned broths, instant rice, canned soups, etc. Ambrosia - 1 package of fat free vanilla pudding, 1 can of crushed pineapple, 1 can of mandarin oranges, 1 tub of fat free whipping topping. Combine first three ingredients. Fold in whipped topping. Refrigerate or place in square baking pan and freeze. Ice Cream Sandwiches - 1 box of light chocolate graham crackers, 1 tub of whipped topping, 2 C diced strawberries. Combine whipped topping and diced strawberries. On a large cookie sheet place one layer of graham crackers. Place 1 T of the whipped topping mixture on each cracker. Top with another graham cracker. Place cookie sheet in freezer for 2 hours. Once whipped topping mixture is set, remove each ‘sandwich’ from the cookie sheet and place them into a zipping freezer bag. Lastly, knowing that not every recipe you try will be successful, make sure to keep a log of the recipes you would like to try again, not try again or edit and try again. This is an on-going process. Good luck and bon appetit!